If you want to customize the Tab 10.1 a lot or simply want to run special apps and utilities that require super user access, you will to root it. Here is a simple and straightforward guide to help with rooting your Samsung Galaxy Tab 10.1 tablet. First download, the root.zip file from here and extract it. Open the extracted folder and click the driver file labeled "GT-p7510_USB_Driver_v1_3_2360_0-Escape.exe". Install the driver. * Hold the Vol Down button (the left Volume button) and then hold the Power button as well. * Keep holding until you see two icons. First you’ll see the Samsung Galaxy Tab 10.1 logo and then the icons will show up. Let go. * Press the Vol Up button (the right Volume button) to select Downloading mode. * You should connect your table to the computer. * Go into the same root folder as before. * Double click the root application named "Odin3_v1.85.exe"
* Double click the clockworkmod recovery file labeled "recovery-cwm_4.0.0.4-sam-tab-10.1.tar.md5" to select it. * On your computer, go to the same root folder as before and transfer the zip file labeled "Samsung_Galaxy_Tab_10.1_root.zip" to your device. Don’t put it inside any folder. * * Hold the Vol Down button (the left Volume button) and then hold the Power button as well. * * Keep holding until you see two icons. First you’ll see the Samsung Galaxy Tab 10.1 logo and then the icons will show up. Let go. * * Press the Vol Down button (the left Volume button) to highlight the left icon. * * Press the Vol Up button (the right Volume button) to select Recovery mode. * Use the volume buttons to highlight "Install zip from SD card" and hit the Power button to select it. * Use the volume buttons to highlight "Choose zip from SD card" and hit the Power button to select it. 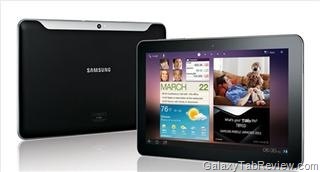 * Use the volume buttons to highlight "Samsung_Galaxy_Tab_10.1_root.zip" and hit the Power button to select it. * Use the volume buttons to highlight "Yes – Install…" and hit the Power button to select it. * When it finishes, the last line should say "Install from sdcard complete." * Use the volume buttons to highlight "*****Go Back*****" and hit the Power button to select it. * Hit the Power button to select "reboot system now"
All credits go to folks at thedroiddemos.com. Here is a video guide to help you even more. Also learn – how to use Galaxy Tab 10.1 as flash drive / mass storage.